Scarsdale Diet - Diet Reviews: Does Scarsdale Diet Really Work? The Scarsdale Diet is not a new weight-loss fad; in fact, the program was originally introduced in 1970. 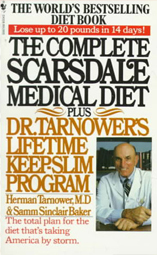 The developer of the diet, Dr. Herman Tarnhower, named the program after the city in which he had a successful medical practice. The Scarsdale Diet, with its adherence to a low-carb, low-fat menu, could be considered a predecessor to other low-carb diets like the Atkins and South Beach diets. However, unlike these newer models, the Scarsdale Diet allowed some complex carbs as well as an assortment of fruits and vegetables. The Scarsdale Diet is a two-week, highly restricted regimen. Some people claim to have lost as much as 20 pounds within that 14-day period. However, at least some of the weight gain may be attributed to water weight, and dieters admit to gaining back some of the pounds once the diet is over. Because it is not recommended that dieters maintain this program for longer than two weeks, the Scarsdale Diet may be considered a jumpstart to a more long-term weight loss program, rather than the complete package. The Scarsdale Diet typically consists of 1,000 daily calories or less, making this diet unattractive to those who do much physical activity on a daily basis. It is a good idea to talk to your doctor before starting the Scarsdale Diet to ensure it is safe for you for this reason. While the diet is very specific in terms of a menu, dieters are encouraged to eat as much as they like until they feel full, but not stuffed. The only snacks that are allowed on the Scarsdale Diet are celery and carrot sticks, with dieters allowed to eat as much as they like. Dieters can also eat as much of the menu selections as they like at meals, until they feel full.